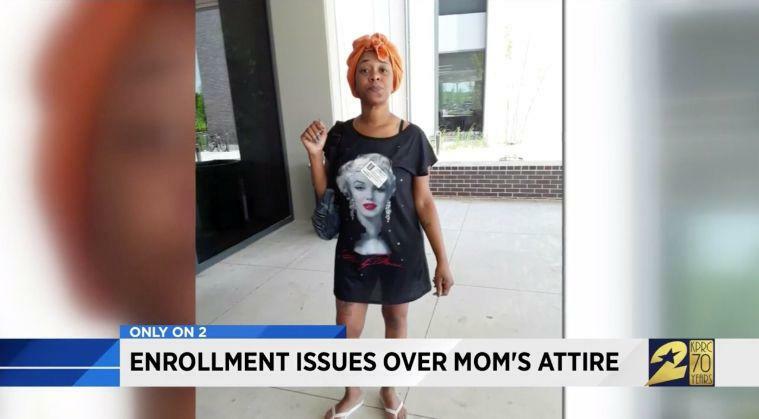 The mother of a Houston high student said that she couldn’t enroll her daughter in classes because she wasn’t allowed on school premises in her outfit, making her wonder if the district has a dress code for parents. According to Houston outlet KPRC, Joselyn Lewis wore a Marilyn Monroe dress and a head scarf when she went to enroll her 15-year-old daughter at James Madison High School in Houston, Texas. But when she arrived, an administrator wouldn’t even allow Lewis on the property because of what she was wearing. “She said that my head scarf was out of dress code and my dress was too short,” Lewis told KPRC. Lewis demonstrated that her dress would pass the finger length test in an interview with KPRC and said that she was wearing the head scarf because she was in the process of getting her hair done. Regardless, she thinks her outfit shouldn’t have mattered. James Madison High School didn’t respond to Yahoo Lifestyle’s request for comment. However, its website has a list of parent responsibilities, omitting any specific regulations regarding how a parent should be dressed. Still, Lewis told KPRC that she planned on going back to the school on Tuesday in a different outfit to attempt to enroll her daughter again. “My child’s education, anyone’s child’s education should be more important than what someone has on, that shouldn’t matter,” she said. Yahoo Lifestyle was unable to get in touch with Lewis. However, she told KPRC that she had unenrolled her daughter from Lamar High School earlier on Monday because of bullying that the teenager had faced. Administrators at Lamar didn’t express any issue with what Lewis was wearing.